During our discussions with publishers about Google Ad Manager 360 (GAM360) over the past few months, we often find ourselves spending a significant amount of time deep diving into one feature in particular on the platform, Exchange Bidding. As one of nine Google Certified Publishing Partners trusted to resell GAM360, publishers of all sizes approach us seeking more information about the sell-side platform and its unique features for managing inventory and growing revenue. Since exchange bidding is a new feature baked right into the revamped GAM360 platform, publishers want to expand their knowledge of the much talked about feature and to hear how exchange bidding will increase their revenue. Today, we will present four key features of exchange bidding that we highlight to publishers so you can also judge for yourself whether Google Ad Manager 360 is the right AdTech solution for you. Released in 2018 by Google, Exchange Bidding is a new method for managing inventory programmatically within GAM360. Previously, yield partners were integrated a publisher through header bidding would compete in a client-side auction with the winning bid sent into DFP to compete with Google Ad Manager (PFKA AdX) and determine the winning bid. On the other hand, with Exchange Bidding the competition takes place server-side with all yield partners competing on an equal level with Google Ad Manager (PFKA AdX) to produce the winning bid. Exchange Bidding runs in GAM360 by utilizing Google’s infrastructure. As a server-side solution, there is no need for additional scripts to embed on your site which makes it faster and helps consume less data compared to header bidding. Publishers will automatically see a reduction in website load latency and an increase in ease of not having to add Header Bidding Wrappers directly on their webpage </head>. 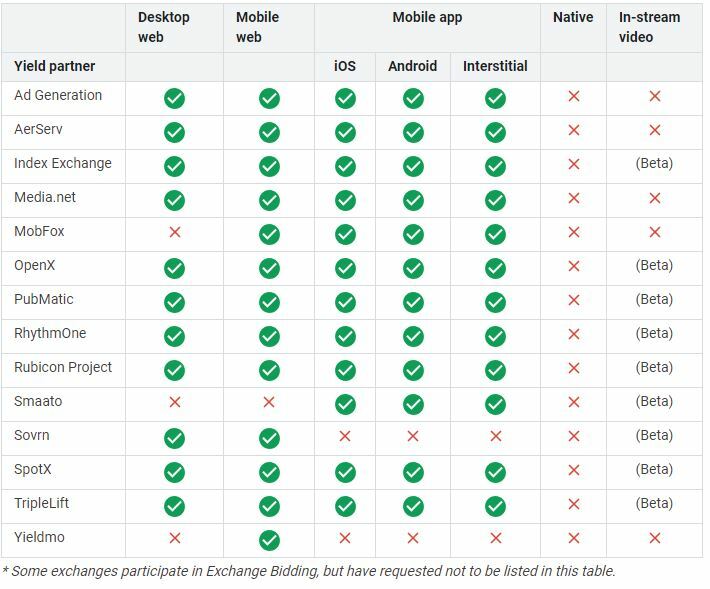 Exchange Bidding marks an end to the advantage Google once held in the Header Bidding model when it had the opportunity to bid after knowing the winning bid from all other buyers who were competing through the header. Today, Exchange Bidding provides a much simplified unified auction conducted on a more even playing field, with a publisher’s inventory being bid on in a competitive atmosphere for every impression, which as a result, significantly increases yield and revenue earned for inventory while reducing a publisher’s workload. Within Exchange Bidding publishers are currently able to choose from a variety of exchange partners that can compete alongside Google Ad Manager (PFKA AdX) for your inventory. Only exchanges that have adopted ads.txt are allowed to participate in order to prevent ad fraud (domain spoofing). Here are the exchange partners (as of Dec. 2018, although this list will grow). Publishers see significant (reportedly double-digit) revenue gains from allowing multiple exchanges to compete equally in a unified auction where each advertiser bids, with the bid being visible to everyone, enabling the highest bid to win. The CPM price is decided by the price the buyer is willing to pay and the number of buyers there are. The higher the demand, the higher the CPM. In addition, using Exchange Bidding enables a publisher’s entire programmatic flow to takes place within Google’s infrastructure, with Google handling the auction, reporting, billing, and payments. This holistic approach has proved to be a substantial financial and operational benefit to publishers since they will not need to wait for payments from each of their demand partners every month. Whereas in the past a publisher would need to wait or even chase for their monthly earnings, Google will now deliver in one payment all the revenue generated through Exchange Bidding from all the yield partners, handling collection on their side. If you would like to begin using Google Ad Manager 360 with Exchange Bidding to earn more revenue from every impression, we are ready to partner with you to assist you to reach your financial goals. For over ten years, our unmatched publisher solutions maximize revenue through advanced proprietary optimization technologies, analysis management tools, and services. We have extensive experience working with publishers to reach optimal revenue results from primary and other indirect demand sources. As a certified reseller, we will provide you with quick and effortless access to Google Ad Manager 360 and Exchange Bidding, accompanying you along the way in close partnership. Expert Exchange Bidding management of your inventory through elite optimization and yield management strategies. Access to more demand than you’re currently working with – OpenX, Index Exchange, Rubicon, Smaato, Sovern, and Pubmatic and more to come. Expert yield team and resources to support you every step of the way. If you would like more information about Exchange Bidding or want to hear from us about how Google Ad Manager 360 can benefit your website by increasing your revenue, you can contact us here.